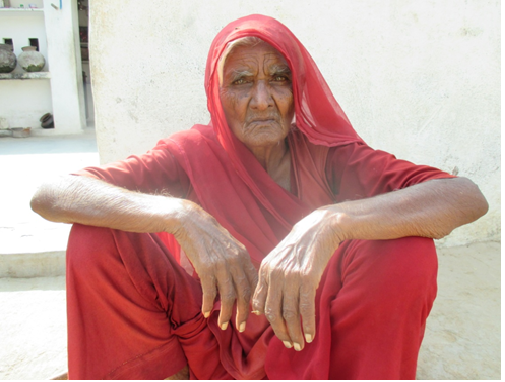 The panchayat of Bijilia village in Barmer district, informed soochna seva team that Bhawar Kawar, who is a 72-year-old widow, is not the resident of Bijilia and that is the reason for discontinuation of the pension that she was receiving. This was a disturbing piece of information for Soochna Seva team as well as for Bhanwar because panchayat has also mentioned that for last two years she did not approach them to inquire about the delay in pension, so they assumed that, she might have moved to another village. Well, Soochna Seva team knew pretty well that the facts that they got from panchayat were partially true because Bhawar has been living with her brother’s family in Bijilia since many years. As, she is childless and her husband passed away about 22 years ago, she had no one to comfort her and help her financially. So, first she moved to her brother’s house and then in 1998, she applied for Vridha Pension Scheme. It has been two years since the money has stopped flowing into her account and there was no one to help her out in resolving this matter. Fortunately, on February 17, 2015; Omprakash and Jugtaram our Soochna Sevaks visited Bhanwar’s house during their door-to-door visit in Bijilia village and came to know about her grave situation. Soochna Sevaks returned to Soochna Seva Kendra and assisted Bhanwar Kanwar to fill an online form so that her name gets registered in the panchayat. After that, it was signed by sarpanch and gram sevak and has also passed the table of revenue officer of panchayat. Due to lack of funds, the officer expressed his inability to release the fund, but he assured Bhawar Kanwar that she will receive the pension very soon.